February 10, 2013 - by Paul Farol - 13 Comments. I am a fan of Paulo Alcazaren and I love the pictures of Old Manila that he keeps posting as part of a long running quiz he calls “MMM”. There’s a lot one can learn about design when you look at the pictures he posts. Â Even if you don’t know much about the history of design or art, pictures have a way of “educating” the eye better than any design or art class one can take. Writers learn to write by reading. Chefs learn how to create gustatory delights by eating great food and watching how it is prepared. Â So, I guess, part of a designer’s training or education would be looking and examining great designs. Paulo is contributing immensely to every one’s appreciation for design. I don’t know of any other person on Facebook who posts as many pictures of Art Deco designs, old blue prints, or works of art than Paulo. That’s why I was enthralled when he accepted my friend request and gamely participated in some of his MMM quizzes. 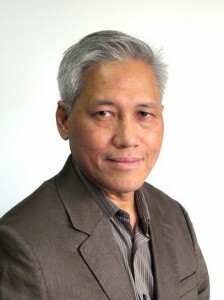 But, of late, his involvement in the “Save Manila Bay” movement has become rather shrill and grating. Paulo has been posting more and more pictures of old Manila Bay/Roxas Boulevard, hitting a proposed reclamation project on Manila Bay. It’s probably because the group he is with is drumming up some excitement and publicity for their “Synchronized Sunset Viewing” on February 12. 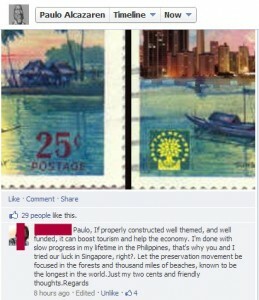 Â Paulo, being the columnist that he is, is trying to rally his followers on social media as well as his personal network to support the movement that is pressuring the government to stop the reclamation project. However, while I sympathize with Paulo’s desire to bring back the beauty and grandeur of Manila as well as Manila Bay, I realize that it cannot be done merely by keeping things the way they are. The Manila and Roxas Boulevard depicted in the photographs he posts have long been uglified by decades of neglect and are in an awful state of disrepair. Â Can they be brought back to their former glory by opposing the reclamation project on Manila Bay? That’s one of the major and jarring disconnects from logic that I find impossible to get over. Perhaps, Mr. Alcazaren would have a case IF the Manila City Government were fully funding the proposed reclamation site on Manila Bay and appropriating funds that would otherwise go to prettifying the facades of all the buildings along Roxas Boulevard. Â But as far as I know, this isn’t the case and most of the funds that will be used for the reclamation project will come from the private sector — foreign and local investors. If at all the city government is spending money on the reclamation site, it would seem to be a good way of leveraging Manila City Government funds. Â Why? One is that the government doesn’t have to shell out all the money for a project which in the end will increase the city’s revenues — a wise move following the adage “rich people use other people’s money”. Â Moreover, all the economic activity from construction up to the time when people start living in and doing business in the new reclamation site will also have a positive impact on the larger economy of Metro Manila as well as the entire country. Â We’re not even counting on finally having a good enough section of Manila where moneyed foreign tourists (not bargain hunting backpackers) aboard international cruise ships can visit without being harassed by swindlers, panhandlers, vagrants, and other forms of low life. Two, is that the development of Â this chunk of Manila Bay — if done correctly — will have a tendency to increase the attractiveness of property in nearby areas. Â If you’ve ever encountered real estate ads advertising a property’s proximity to other developments you’ll get a pretty good idea of what I am talking about, i. e., “1o minutes from Bonifacio Global City”, “10 minutes from Ayala Alabang”, or “5 minutes from the University Belt, Hospitals, and Churches”. The thing is urban renewal that is fully funded by the city is a very costly undertaking as well as politically volatile as it would have the Mayor battling it out with so many building owners. Even if only incentives, regulations, and ordinances would be used to compel building owners to undertake the restoration of their buildings (something that, perhaps, Paulo Alcazaren would conceivably benefit immensely from),Â these “devices” would still have an immense cost. Next Article I Have Seen the Future and it is EXPATS!!! Thanks. The next post will be about debunking claims that reclamation on the bay will worsen flooding in Manila. I think there’s a major misunderstanding about what causes flooding in Manila. A nice illustration, just like your post on why the reclaimed land wouldn’t block the sunset, will be appreciated on why it will not cause flood. Educate me, please: Wouldn’t such developments have a good chance to block the iconic view of sunsets at Manila Bay? Also, I think it’s ideal if the private sector pitches in on redeveloping the baywalk, although it seems unlikely if we assume that all corporations prefer developments with profit. And yes, of course, I agree with you on splitting the cost of developments between the public and private sector. To put it simply, no the sunsets won’t be blocked. There may be no connection between the sunset and the actual environmental condition of the bay. Or the connection may be mistaken. What if the actual effect is that the sunset becomes more beautiful the greater the pollution? Then the sunset would be the basis for letting pollution grow more. The more important thing would be “cleaning up” or rehabilitating the bay for a better use. Perhaps the reclamation may do this. And if the reclamation does block the sunset, all you need do is just go to the back of the reclaimed site and watch the sunset from there. They can build viewports or a boardwalk there for that purpose. Even if it’s blocked from Roxas Blvd, you could always find another vantage point to see it. Symbolic connection “daw” ang namamagitan between the sunset and the condition of the bay. When I heard that, I went… hmmm…. You hit the target right my friend, minsan naniniwala ako na marami sa atin maliit magisip, if the new development will offer you a more panoramic view so why would you oppose, pwede mo naman ilipat yung upuan mo from your usual vantage point and enjoy the view you want. The problem with a lot of Pinoys they complain without looking at the big picture first. In my part of Sampaloc, Manila, wala na iyong mga squatters sa riles. What does the Baywalk offer to the people that is not found in other esplanades around the world (aside from the sunset)? A new unique attraction can bring new life to Roxas Boulevard. Okay, maybe it doesn’t have to be unique, but the City Goverment and or Save Manila Bay can think and execute ideas which can bring new appreciation for the area. Plus, if redeveloped nicely, it can complement the proposed reclamation site. Current protests against Solar City, however, are against ANY AND ALL redevelopments along Manila Bay, regardless if these plans are good or not.